Looking for a partner to help launch your next big idea? Stuck trying to figure out why your current website isn't driving the clicks, calls, or sales you'd hoped for? 'Vrrb' means action, and it's more than just our name, it's our passion. What action are you seeking? More sales, better brand awareness, bigger donations, more views, a greater number of followers or subscribers? Whatever your objectives, your team at Vrrb Interactive will conceptualize, plan, design and build a solution that delivers results! Tempo LLC designs and installs custom lighting systems in theaters and commercial buildings. 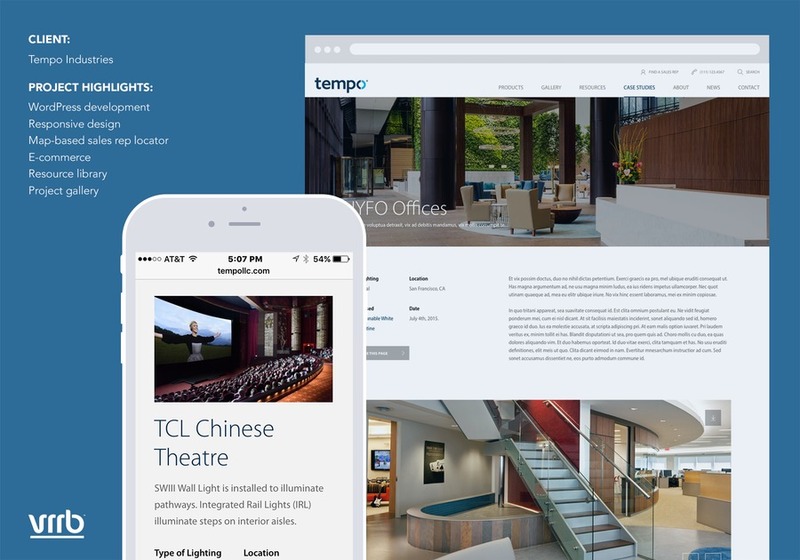 With a 30-year track record of delivering sophisticated solutions to major clients such as TCL Theatres, Tempo needed a web presence that would show off their work to prospective clients, while also providing current customers with access to product manuals and resources. Vrrb Interactive developed a comprehensive web experience that showcases Tempo's cutting-edge work, including case studies, installation photos, and product details. A resource library provides customers with access to CAD drawings and technical documentations, while a map-based Sales Rep locator helps visitors get in touch with their local distributor.